If you use single-vision lenses, you will have a great view at the distance they are made to help you with. However, when you look at other distances, the view will be blurry because the vision correction is tuned to just the one focal point. This is problematic if, for example, your glasses help you see distances but you need to look at your speedometer. Using bifocals or trifocals to get the right vision correction at different distances can work, but these glasses pose two problems. One is that the focus “jumps” suddenly as your eyes pass between fields. If you want to glance between your instrument panel and the road a few times in a row, for example as you’re adjusting to a new speed, this can be jarring. The other problem is that there are visible lines between each segment of a bifocal or trifocal lens. Many people think this makes them look like “old person’s glasses” and want to avoid that effect. Progressive lenses are line-free multi-focal lenses. This eliminates both of the problems of bifocals and trifocals. Since there are no hard lines, the focus changes smoothly as you look through different parts of the lenses. They also look like single-vision lenses to onlookers, so you don’t seem older than you are. What Should You Keep in Mind When Choosing Progressive Lenses? If you’ve never worn progressive lenses before, you may need to go through an adjustment period before they seem natural to you. During this time, your view may seem to “swim” or you might have trouble catching things in your peripheral vision. Usually, it only takes about three days for you to unconsciously adjust to the way the glasses work, but some people need up to two weeks. Once you’re used to the new lenses, they will seem very natural and you won’t have to worry about it. Because of this adjustment period, it’s a good idea to start out using your glasses when you aren’t riding your bike. Instead, begin by wearing them around the house and progress to taking walks outdoors while you have them on. This will let you adjust safely. Once you seem to have adjusted, take some short rides to be sure. After that, you can ride as much as you want without any problems. Are There Any Extra Options to Consider When Choosing Motorcycle Glasses? The answer depends, in part, on where and when you expect to ride. If you’ll frequently be using roads that reflect high amounts of glare from sunlight, or you have to deal with glare from headlights and streetlights, you should consider polarized lenses. Polarized lenses cancel glare that reflects up from the ground and other low surfaces. This eliminates the “washed out” look that roads sometimes have. The effect can be easily seen when driving on a concrete road, though asphalt isn’t entirely immune to it. If you commonly ride at night in areas with bright white or bluish streetlights, you may find it worthwhile to add a coating that blocks blue light. This band of wavelengths is hard on the eyes and can cause them to become fatigued before you’re ready to stop riding. It can also interfere with your sleep patterns and cause insomnia. If you usually ride during the day, but make several trips in and out of places along the way, then Transitions lenses or an equivalent can be a good bet. These lenses darken when outside in the sun, but revert to clear after a few minutes indoors. This lets you avoid the need to either carry two pairs of glasses or try to see inside with dark sunglasses. On the chance that you drive during the day and do not make a lot of stops, consider full-on sunglasses to block UV light and help prevent eye strain. Choose a gray shade to turn down the brightness without too much color distortion. Some of the same things that make a frame good for everyday use are also good for motorcycle glasses. Look for one that is lightweight, has the right width and temple length to fit your face, and that has a design that matches your personality. Typically, plastic frames are more durable than metal ones, so if your glasses have to take some abuse or go through a lot of on/off cycles, they’re usually a good bet. Metal frames have a light and stylish look, but quality varies. It’s worth it to pay a bit more to get sturdier frames if you go with metal. If you’ve chosen sunglasses or photochromic (Transitions) lenses, consider a wraparound frame style. With this style, the lenses curve slightly around at the sides, so you get less light infiltration from those directions. This can make riding much easier if the sun is to your right or left. The main thing you need before you buy your glasses at our site is your prescription. You’ll need a recent one from an eye doctor. You will also need your pupil distance (PD). Instructions for measuring your PD are on our site, but if you can get it from your eye doctor or optician, that’s even better. Once you are armed with this information, just come to our site and pick a frame. Once you’ve selected one, you’ll be taken to a screen to enter the prescription and PD data. After that, you can select your lens options. These include lens type (such as progressive, bifocal, or single vision), lens material, tinting, and coatings. It’s all quite simple thanks to easy-to-use pages. 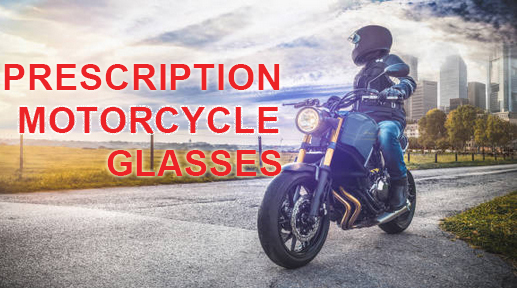 To get started on getting your progressive lenses motorcycle glasses, just come to our site at PrescriptionMotorcycleGlasses.com. We’ll be glad to make your perfect pair for you.